I had one of those supervision sessions today where I realised I knew stuff about a topic that I didn’t know I knew. This relates to the family secret. Some families have a secret where each member agrees to keep it. It can be due to embarrassment (at least initially). The family decides it’s better if they keep a piece of information secret from the public. Examples could be that mother is a hoarder, father drinks too much, son has a drug problem, daughter is neurotically anxious, and the like. This is done because they are embarrassed if the information got out to the neighbours or relatives. Other families keep secrets for more serious reasons such as legal implications. Father may beat mother or there maybe some kind of child abuse going on, or reasons to contact the department of child protection because the family conditions are so strange or involve some kind of neglect. From a family structure point of view it creates interesting dynamics. Initially it is done to avoid embarrassment or legal problems but then the family begins to structure itself around the secret and it literally becomes part of the family and how it functions. In one way it becomes like another member of the family. For example the family have to look after it and protect it. It starts to rule their lives at times in quite profound ways. For example if mother is a hoarder, no family member can bring someone into the house to visit or as a guest. Or as was the case today when others visited, the daughter had to be in her room and not come out because people would see how odd she behaved and neurotic she was. It does create a rigidity and lack of ease or spontaneity in the family as everyone has to remember to keep the secret and can’t let anything slip. As mentioned before it can certainly create a sense isolation for the family members as others have to be kept away or at least kept in the dark and not allowed into the inner circle which would require some level of disclosure of the secret. The family becomes quite inward looking which can also create a sense of cohesion in the family and a sense of us and them (outsiders). This allows for secondary gains. Whilst the original reason to keep the secret was because it is embarrassing it can over time become a way of maintaining a strong sense of belonging in the family which can then also become a reason for maintaining the secret. Some family members can behave in odd and embarrassing ways. So it is kept locked away. The therapeutic response is clear. 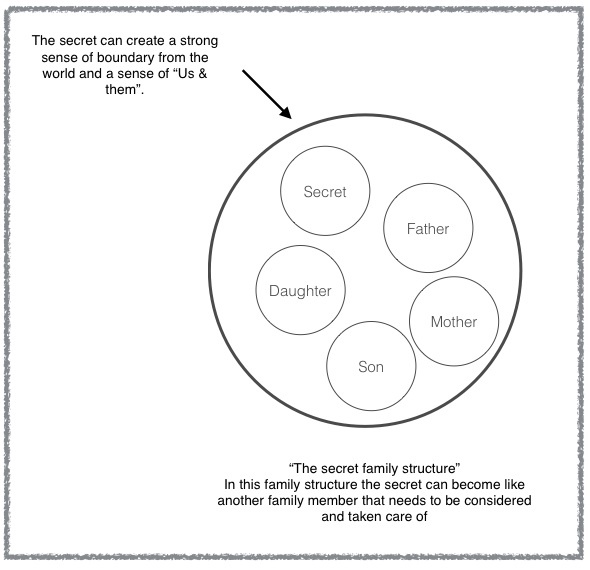 Get the family secret exposed and this can change family dynamics, quite profoundly at times. If it is just embarrassing that can be done but if there are legal implications then it may be much harder. However if the client exposes the secret to the therapist that is a good sign in itself, as the client is developing a significant level of trust in the therapist. Also one needs to be aware that when the secret is first exposed it is quite possible one is not getting the full story and there may be more to come later. I recall a man who was quite a bad hoarder. When he divulged this to me I asked him to take some photographs of it on his phone and bring them into me to look at. He eventually did and once the secret was exposed there is nothing left to hide which significantly changes the psychological circumstances of the person’s life. They no longer have to maintain the secret and censor what they say (at least to some degree initially). After time he and I would speak about his hoarding openly such that at least in our relationship it became a non issue and freed up how we could relate. The rigid structure he brings into the relationship is reduced, at times significantly which is a positive psychological outcome, indeed. Thanks for this- very useful!